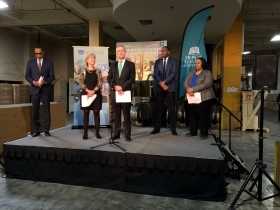 Medical College and Greater Milwaukee Foundation will anchor redone Bronzeville building. Schuster’s Department Store today (left), conceptual rendering of future plans (right, Engberg Anderson Architects, Kahler Slater). Bronzeville will soon have two new anchors. The former Schuster’s Department Store at 2153 N. Dr. Martin Luther King Jr. Dr., long clad in a protective metal cover, will soon be home to the Medical College of Wisconsin‘s Flourishing Lives Initiative and the headquarters of the Greater Milwaukee Foundation (GMF). 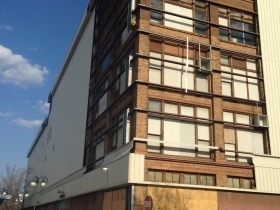 Developer Royal Capital Group intends to build apartments on the building’s upper floors. A $100 million transformation of the 122-year-old complex is going to take a lot of vision. 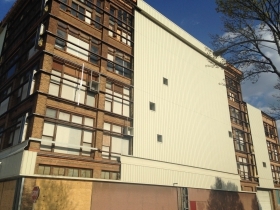 The complex has been used by moving and storage provider C.H. Coakley as a warehouse for more than two decades. Tuesday’s announcement took place between rows of items stored on pallets and the temperature inside had everyone keeping their coat on. “Sorry about the temperature. When we say it’s temperature-controlled we mean it’s above 40 degrees,” said building owner Michael Coakley. 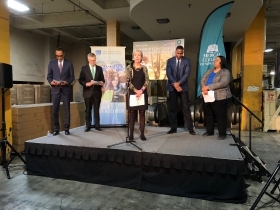 Dr. John R. Raymond, Sr., President and CEO of the Medical College of Wisconsin (MCW), and Ellen Gilligan, President and CEO of the GMF, presented the conceptual plans to a room full of supporters, neighborhood residents and members of the press. “MCW went through a period of deep internal reflection following the Sherman Park unrest,” said Raymond of inspiration for the initiative. The foundation joined the effort last year. “We at the Greater Milwaukee Foundation truly believe we are greater together. And we are here today to live that vision,” said Gilligan. MCW’s Flourishing Lives Initiative is aimed at transforming Milwaukee into one of the healthiest and safest cities in the country. The college’s plan is to aggregate its community-facing programs in one location to provide community engagement and support research and policy change. Central to that plan is a desire to create “a front door for MCW to the community,” said Raymond. Envisioned with that is the relocation of personnel, including faculty, from the college’s Milwaukee County Medical Center campus in Wauwatosa, though Raymond said much work remains to be done to regarding what programs and staff will relocate. They’ll also have to decide what to call the thing; MCW senior vice president Greg Wesley said the name is likely to change as the plan evolves. Raymond stressed that Wisconsin has the highest quality of health care in the state, but that the state’s relative rankings of health have declined. “Safe neighborhoods, good housing, stable housing, stable homes, great education. These are social determinants that are much important than the quality of health care in terms of your overall quality of life and opportunities that are provided to you,” said Raymond. “We can build a million clinics, but if we aren’t dealing with the other issues that influence our daily lives and health, we are still not going to be as well as we need to be,” said area Alderwoman Milele A. Coggs in support of the plan. Coggs said it was essential that the organization work with area residents to finalize the plan, and Raymond promised a period of “deep, deep engagement” in the coming months. 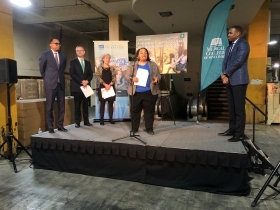 The college, along with the Greater Milwaukee Foundation, intends to occupy approximately 150,000 square feet in the building. A portion of that space will be reversed so that area residents of not only Bronzeville, but nearby Halyard Park, Hillside, Harambee and Brewers Hill can gather. “We are not here just to help you. You are going to help us,” said Raymond. The Greater Milwaukee Foundation will relocate from Schlitz Park to the building. Gilligan said when the organization moved to the former brewery ten years ago it was at the northern edge of the economic growth of Downtown and she hopes this relocation will help push that energy further north. GMF operates 1,306 unique funds with $913 million in assets according to its 2017 annual report. It provided $43.5 million in grants in 2017, over half of which went to community development. Of the 2017 grants, $27.7 million went to 578 agencies located in Milwaukee County. 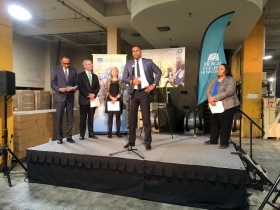 In addition to those grants, the organization provided $52 million to support the construction of Fiserv Forum via a tax-deductible donation from former Milwaukee Bucks owner Herb Kohl. 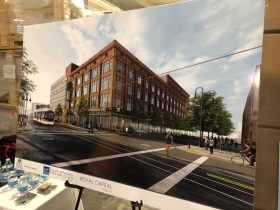 Royal Capital Group will lead the redevelopment. The firm, led by Kevin Newell, will buy the building from Coakley. MCW and GMF will lease space from Royal Capital. Much work remains to be done on putting the plan together. The Schuster’s building complex dates back to 1907. The building contains 454,883 square feet of space spread over six levels according to assessment records. Expanded many times, the original four-story department store was designed by the architecture firm of Kirchoff and Rose in the Chicago Commercial Style. The complex housed a department store until 1970 when Schuster’s successor Gimbels closed the store. It was later used as a warehouse by Gimbels and the former department store chain decided to protect the facade with a metal wrap. Coakley was thanked by a number of speakers for maintaining the building over his two decades of ownership, but historically-sensitive redevelopment still won’t be easy. Newell said construction would likely take 16 months. He hopes to begin work in September, placing the opening in 2021. 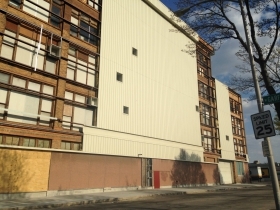 Newell told Urban Milwaukee that construction on the “market-rate” apartments would run concurrently with the buildout of the space for the non-profit groups. He said the effective above ground space to redevelop is 350,000 square feet, leaving approximately 200,000 square feet for apartments. The firm is still considering a number of financing options for the project, including low-income housing tax credits, said Newell. Department of City Development Commissioner Rocky Marcoux told Urban Milwaukee that the city envisions playing a role in the project, but a specific request regarding a tax-incremental financing district has not been made. Coggs acknowledged that residents will likely experience inconveniences during the construction, but said she remains committed to creating a final product the entire neighborhood can be proud of. 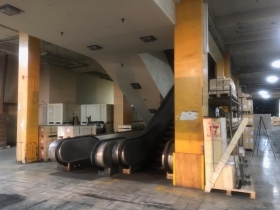 And despite the appearance on the outside, elements of the building’s former grandeur are visible inside, including the escalators located behind the makeshift stage. Coakley, through a contractor, had portions of the metal covering removed in 2015 to assess the facade’s condition. The firm secured historic preservation tax credits at the time, a blessing given that the state now has a $5 million per project cap. A $100 million investment could result in up to $40 million in state and federal tax credits being issued. Coakley won’t be fleeing the city. The logistics firm will maintain its offices in the adjacent building at 2151 N. Dr. Martin Luther King Jr. Dr. Coakley told Urban Milwaukee his firm purchased a building at 620 E. Vienna Ave. in the Riverworks Center recently, and will announce the purchase of another facility next week. He declined to provide a sale price for the Schuster’s complex, assessed for $2.4 million in 2018, but said he has received higher offers in the past. A beautiful building to be uncovered and restored. I see the HOP in the illustration. keep it expanding!!!! With a vibrant downtown as anchor, development is now being pushed out into surrounding districts. Expanding the HOP along the old streetcar routes will help restore Milwaukee to glory. This time, however, that glory will not include racially segregated ghettos. When the least among us thrive, we all prosper.